“Our dark night of the soul seems endless. Yet it’s something that must be faced. It’s the duty of each of us to look into our bins, follow the garbage trucks to their destinations, behold the alchemy of waste." Waste. Billions of tonnes of plastic in our oceans and many more billions of industrial, commercial, and household materials filling landfills trawled by rag pickers rescuing the best of our excesses. It’s our dirty not-so-secret, a source of guilt and shame, one of the primary banes of the 21st century. It’s what remains when the golden profits have been siphoned off. As end and beginning it is the khmi, ‘black earth’, at the root of khēmia which gives us alchemy, the prima materia. Its slow decomposition, the nigredo, ‘blackening’, is our shadow made real, our long dark night of the soul. It’s the domain of Afagddu, ‘Utter Darkness’, Ceridwen’s ugly son, who did not taste the universal elixir. Long before there were human alchemists the earth was dealing with waste through alchemical processes. The oil from which we make the plastics which plague us today was formed from the burial of dead animals and plants on the bottom of the sea through diagenesis (chemical reaction, compaction, microbial action) and catagenesis (thermal degradation) during the Carboniferous period. Humanity’s manipulation of alchemy by fractionating and cracking the hydrocarbons in crude oil to make petroleum for fuel and produce plastics by polymerisation has birthed ingenious creations which are useful whilst in use but dangerous when discarded because they take so long to decay. Because plastics are not biodegradable plastic bags can take 1000 years to decompose, sanitary towels and nappies 500 – 800 years, and plastic bottles 450 years. Out at sea, plastics are photograded by the sun’s UV rays breaking down the polymeric chains turning big pieces into lots of tiny pieces. Microplastics: ‘rayon, lyocell, ramie, nylon, polyethylene, polyamide, and polyvinyls such as polyvinyl chloride or PVC’ have been found 11 kilometres down in the guts of crustaceans who are eaten by fish who are eaten by sea birds (and humans) contaminating the food chain with deadly consequences. Our dark night of the soul seems endless. Yet it’s something that must be faced. It’s the duty of each of us to look into our bins, follow the garbage trucks to their destinations, behold the alchemy of waste. I live in Penwortham, Lancashire, in North West England, where the average person produces 412kg of waste a year. In 2016/2017 Lancashire’s recycling and composting rate was 45.6% (England’s average was 44.9%). 37.4% of general waste went to landfill and 12% to energy from waste. Lancashire’s recycling is taken to the Global Renewables Recycling Centre in Farington where it is ‘weighed, checked for contamination and is then processed through GRL’s sophisticated sorting equipment’. It is then sent to a variety of ‘alchemists’ to be transmuted into recycled materials. Glass greater than 25mm goes to Refresco in Cheshire who send it to manufacturers to be melted down in a furnace and made into glass bottles and jars. Mixed glass smaller than 25mm is taken by Greener Futures in Blackpool to be made into aggregate or used in filtration systems. The smallest pieces go to JA Jackson Recycling in Preston to be processed into filler for roads and stone. Textiles are delivered to I & G Cohen Ltd in Salford or Wilcox Textile Reclaimers in Bilston who sort and grade it. Used clothing is exported to Eastern Europe, Africa, and Asia to be sold. I was shocked but not surprised to hear that the ‘crème grade’ items are sent to Eastern Europe and ‘a Tropical mix grade’ to Africa, demonstrating a distinctive social hierarchy with the Western Europeans who discard the clothes at the top, Eastern Europeans in the middle, and Africans at the bottom. Ripped or blemished items are baled up and sent to recycling centres to be made into cloths. Plastic bottles are sent to Viridor in Skelmersdale where they are sorted into streams of polyethylene terephthalate (PET) and high-density polyethylene (HDPE) then ‘intensively washed and granulated to form new flakes or pellets of polymer which are than sold to be manufactured into new plastic products’. Film and rigid plastics go to Hanbury Plastics Recycling Ltd in Stoke-on-Trent and other plastics to JKN Polymers Ltd in Hull where they are turned into manhole foundations and cable troughs. EMR in Manchester, Liverpool, and Salford take scrap metal, producing ‘over 100 grades of high quality recycled materials’. Cans go to Recycling Lives in Preston where they are baled and processed for remelt elsewhere in the UK then rolled into sheet material for new cans or steel products. Paper and card goes to Saicur Natur UK in Manchester who process it into ‘plasterboard and other liners’. Last year 303,000 tonnes of Lancashire’s waste was disposed of, primarily by landfill. LCC’s only current landfill contract is at Whinney Hill, Altham, in Hyndburn, which is owned by Suez (formerly Sita UK). Whinney Hill started life as a quarry in the late 1800s and quarrying for sandstone and shale is ongoing. The application for ‘infilling’ ‘the existent and emergent void’ with ‘household, industrial, and commercial waste over a period of approximately forty years’ was put forward in 2005 (it had been used as landfill for inert waste prior to this). It covers 70 hectares of land and will be full by 2050. 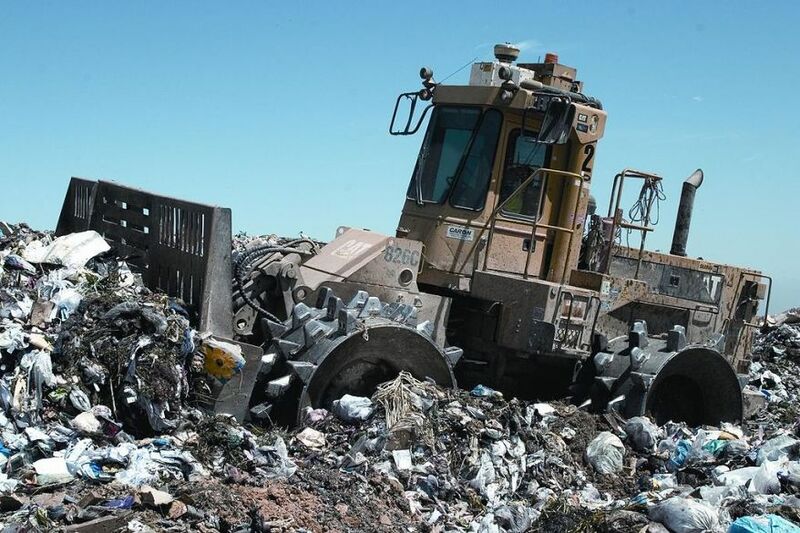 Disposal in landfills is the least preferable form of management due to the waste of materials, loss of land, the risks of explosions and groundwater and air pollution, and generation of greenhouse gases. Nevertheless, the alchemy of landfilling is fascinating by virtue of the ingenuity of both its human and non-human participants. Firstly a liner, usually of engineered clay plus a synthetic geomembrane, is laid down and covered with sand or gravel. Pipes are set in place to collect the leachate. After trucks have dumped their load, track-type tractors spread the waste and landfill compactors with impressive steel teeth on huge metal wheels drive over it in a fourfold pass to compact it down. The ‘working face’ is covered each night with a layer of soil to control odours and deter ‘vectors’ (ie. rats). Within days aerobic bacteria get to work breaking down the organic material by glycolysis, the citric acid cycle, and oxidative phosphorylation. Once the oxygen is used up anaerobic bacteria take over using hydrolysis, acidification, and acetogenesis. Methanogenic archaea complete the process by methanogenesis. These activities release carbon dioxide, methane, and small amounts of ammonia and hydrogen sulfide into the atmosphere. The latter were, no doubt, the source of ‘a horrible sour smell’ so bad local residents could not open their windows or put their washing out, resulting in legal action in 2012. Methane, a greenhouse gas 25 times as strong as carbon dioxide in global warming potential and potentially explosive, is collected by gas wells and either flared off or used as a renewable energy source. The Whinney Hill site generated 3,686.00 MWh from landfill gas in October 2017 making £293,341.78. Once a section of landfill is full it is capped with a liner and approximately 24 inches of soil and vegetation is planted. By 2050 Whinney Hill will have been landscaped and will probably become a nature reserve like many of the former landfill sites in my locality such as Carr Wood and Fishwick Bottoms. In 2016/2017, Lancashire sent 36,000 tonnes of general waste to Viridor’s energy from waste facility at Runcorn. The plant was constructed in 2010 as a joint venture with INOVYN and burns up to 850,000 tonnes of Refuse Derived Fuel (RDF) per year. Like landfill, energy to waste possesses its own alchemy. Municipal Solid Waste (MSW) is processed into RDF through the separation and removal of metals, glass, and stones, and by shredding. It is delivered by HGVs and freight trains, weighed, then unloaded down chutes into the main fuel bunker. The RDF is then fed into one of four combustion chambers and heated at 850°C. The heat is used to create steam, driving turbines to produce electricity. The waste gases are treated by hydrated lime injection, activated carbon injection, and a bag filtration system. Viridor go to great lengths to show their facilities meet the Environment Agency standards for emissions of total organic carbon, hydrogen chloride, carbon monoxide, sulphur dioxide, and oxides of nitrogen. Oddly nothing is mentioned on the Viridor website about carbon dioxide emissions. The incineration of one tonne of MSW produces approximately one tonne of CO2. I haven’t been able to find any figures for RDF, but assuming the amounts are similar, Runcorn could emit up to 850,000 tonnes of CO2 a year. (In 2017, the UK emitted 381 million tonnes of CO2). Friends of the Earth note ‘electricity-only incinerators emit 33 percent more fossil CO2 than gas power stations’ and Combined Heat and Power (CHP) facilities like Runcorn ‘have similar efficiency to gas-fired plants’. Whilst superior to landfilling because methane emissions have a higher global warming potential than carbon dioxide, they are not, as claimed, a form of ‘green energy’ or environmentally friendly. Runcorn ‘generates up to 70MW of electricity and up to 51MW of heat for exclusive use by INOVYN’, a ‘premier chemical company’ belonging to the petrochemical firm INEOS. INEOS is the UK’s largest holder of fracking exploration licences and intends to use shale gas as feedstock in the manufacture of plastic and to power its plants. INOVYN Chlorvinyls produce chlorine, chlorine derivatives, chlor alkali, general purpose vinyls (these include PVCs) and speciality vinyls. Some of their chlorine products, which include pesticides such as Dichlopropene, a chemical currently being phased out by the EU, are harmful to the environment. The manufacture of more plastic can only add to our problem. It seems counter intuitive for Viridor to be fuelling this chemical giant until we see through their green guise to the centrality of capital. The government’s aim to divert waste from landfill to energy from waste is less rooted in concern about climate change than the potential to use our waste to fuel the economic growth of the industries’ increasing pollution. Another example is the VPI Immingham CHP plant, which generates up to 1,240 MW of electricity and 900t of steam per hour for the Humber and Lindsey oil refineries. Not only do we pay local authorities to take our waste away, but polluting industries are profiting from it! III. Gold or Black Earth? My investigations have led to a deeper understanding of where my waste goes and the alchemical processes by which it is treated. Establishing an awareness of where each item I put into my green, blue, brown, and grey bins ends up, exactly what happens to it, and who profits from it, provides a much firmer foundation for ethical living and resisting exploitation than simply following instructions to refuse, reuse and recycle, and being bombarded with photos of dead sea creatures. On a personal level I can make a small difference by composting most of my organic waste, recycling glass and some plastics, and using as few non-recyclable plastics as possible (not always easy when the only shops within walking distance still use plastic wrappers for meat and on some veg). On a national level we are paralysed by a hypocritical government who make a big show of encouraging plastic free aisles in supermarkets and ending the exemption on small shops charging 5 pence per carrier bag, whilst pledging unprecedented support for the fossil fuel industry and making no effort to stop chemical plants manufacturing the non-recyclable plastics they claim to be concerned about. The aim of alchemy is the transmutation of the prima materia into the universal elixir or, more tellingly, gold. The primacy of golden profits has led to the exploitation of the black earth – dug up, drilled out, transmuted. What cannot be made into gold has been discarded and become a legacy of poison. Our long dark night of the soul can only get darker as the Gwions of this world continue to drink up the awen from the cauldrons of our modern alchemists and the rest of us are left with Afagddu in utter darkness with the poisoned fumes, slow leakage of leachate, and suffocation of our sea waters. Yet, if we set aside the notion that life should be a progression from black earth to gold, our dark night might be seen as a revelation in itself and not a step on the way to the profits of the shiny-browed. This I learnt when I sat with Afagddu and watched the RV Ocean Starr and her seventeen sister vessels trawling from east to west with their tow nets gathering data with bottles, buoys, fishing nets. This I learn whenever I pick up litter from my local valley and walk on landfills. It might be learnt from any litter picker, rag picker, garbage man, driver of landfill compactors; gulls, rats, fungi, aerobic and anaerobic bacteria, methanogenic archaea; any guide to the alchemy of waste. Russell Hutchinson (Waste & Transport Officer SRBC), email communication, March 2017. Lorna Smithers is a poet, author, awenydd, and Brythonic polytheist. She is currently exploring how the ancient British myths relate to our environmental and political crises and dreaming new stories. As a devotee of Gwyn ap Nudd, a ruler of Annwn, she seeks to reweave the ways between the worlds. She has published three books: Enchanting the Shadowlands, The Broken Cauldron, and Gatherer of Souls. Her work has appeared in a number of Pagan publications and poetry magazines such as Pagan Dawn, Air n-aithesc, Moon Poets, and The Dawntreader. She writes for Gods & Radicals, has edited and co-edited A Beautiful Resistance, and is co-editing an anthology for Awen & Awenydd. She blogs at SIGNPOSTS IN THE MIST. You can follow her on TWITTER and FACEBOOK, and support her on PATREON. See her books available at Gods&Radicals Press HERE.